“Amtrak moves people, the economy and the nation forward everywhere the trains go,” said President and CEO Joe Boardman. “In towns all across America, Amtrak brings economic opportunities for people, businesses and communities to grow and prosper,” stated Tony Coscia, chairman of the Amtrak board of directors. During FY 2013, Amtrak’s state-supported corridor services grew to a new record of 15.4 million passengers. In addition, all long distance routes combined had the best ridership in 20 years with 4.8 million passengers. Ridership for all Northeast Corridor services reached 11.4 million passengers, the second best year ever. As evidence of a strong ridership rebound following Super Storm Sandy, the Northeast Regional service set a new record. Also, FY 2013 produced eight individual monthly ridership records, the single best month in Amtrak history and new records on 20 routes. In addition, ticket revenue increased to a record $2.1 billion. State-supported services are vital links in the Amtrak national network. The power of increasing demand for passenger rail is recognized through state investments to improve service, speed and safety. In addition, states and communities realize stations served by Amtrak are anchors for economic development, catalysts for historic preservation and tourism growth, sites for commercial and cultural uses, and points of civic pride. Amtrak to place more than $12.6 billion back into the economy through the purchasing of goods and services and employee salaries to maintain, operate and improve its national network. “This year’s record ridership was achieved station by station in the more than 500 communities across America that Amtrak serves,” said Boardman. 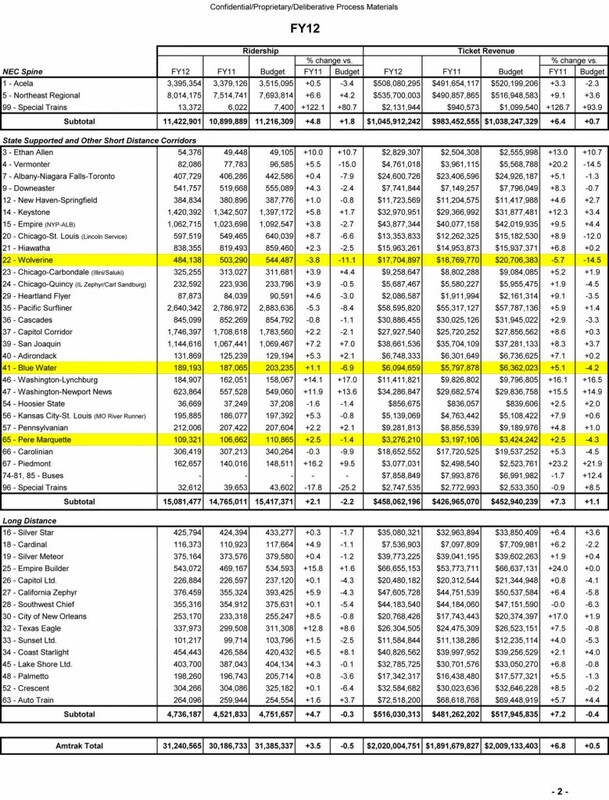 Attached is a listing of the top five stations per state by ons/offs. Amtraks’s Eastbound train 350, the Wolverine, splits the signals at CP Ypsilanti on a dreary April day. The train connects Chicago and Detroit and it saw an increase in ridership of 9 percent in the first six months of the current fiscal year. Photo by Steve Sobel. Amtrak ridership increased in the first half of FY 2013 (Oct. 2012 – March 2013) and March set a record as the single best month ever in the history of the railroad. In addition, October, December, and January each set individual monthly records. Rebounding strongly from service disruptions caused by Superstorm Sandy and other severe weather, Amtrak ridership grew 0.9 percent in the first six months of FY 2013 as compared to the same period the prior year. In all, 26 of 45 routes posted ridership increases and Amtrak expects to end the fiscal year at or above last year’s record of 31.2 million passengers. “The continued ridership growth on routes across the country reinforces the need for dedicated, multi-year federal operating and capital funding to support existing intercity passenger rail services and the development of new ones,” said Amtrak President and CEO Joe Boardman. Northeast Corridor ridership took a significant hit from Superstorm Sandy, is seeing a solid recovery and is predicted to show gains for the full fiscal year despite being down 1.2 percent for this six-month period. Ridership on state-supported and other short distance routes is up 2.7 percent and long-distance ridership grew 0.5 percent. 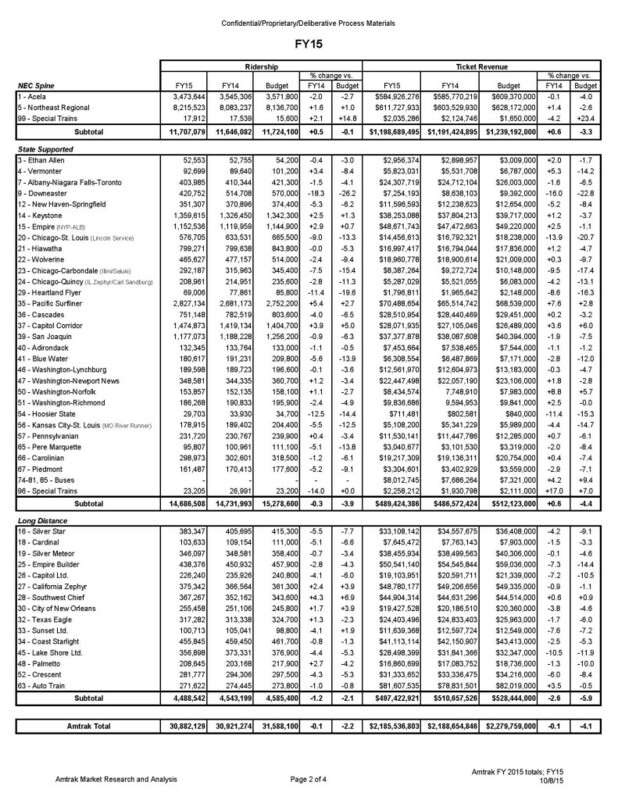 Routes with notable ridership growth in the first six months of FY 2013 include: Palmetto (+10.5 percent), Coast Starlight (+10 percent), Illini/Saluki (+9.8 percent), San Joaquin (+8.9 percent), Piedmont (+8.6 percent), Wolverine (+8.2 percent), Vermonter (+6.7 percent), Carolinian (+6.3 percent), Keystone Service (+5.2 percent), Springfield Shuttles (+5.2 percent), Downeaster (+4.8 percent), Pacific Surfliner (+4.3 percent), and Pennsylvanian (+4.3 percent). – Amtrak trains in Michigan have set new ridership records for FY 2011. – Despite track work and freight slowdowns, the Wolverine service continues to grow. – Blue Water service has impressive passenger growth. October 13, 2011 — Amtrak trains in Michigan have set new ridership records for the fiscal year that ended Sept. 30 and collected $27.7 million in ticket revenue. Although track work and freight slowdowns between Detroit and Chicago strongly impacted the Wolverine service and contributed to slower growth than anticipated, all three Amtrak services experienced increases in ridership and revenue. In figures for the 2010-2011 fiscal year, 503,290 passengers rode Amtrak Wolverine service trains on the Pontiac/Detroit-Chicago corridor, an increase of 4.9 percent from the same period a year ago. Ticket revenue was up by 11 percent to $18,769,770. 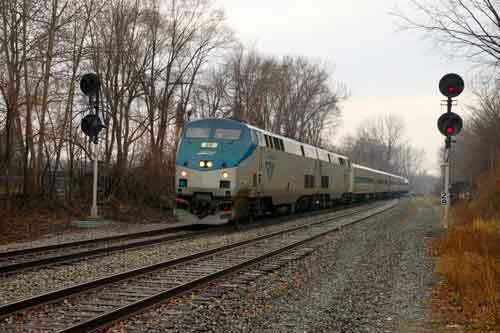 The Blue Water service on the Port Huron/East Lansing-Chicago route saw an impressive 18.6 percent increase with 187,065 passengers using the Amtrak service in FY2011. Ticket revenue was up by 22.3 percent to $5,797,878. Ridership on the Pere Marquette service on the Grand Rapids-Chicago route experienced a gain of 4.7 percent with 106,662 passengers riding Amtrak, while ticket revenue rose 9.8 percent to $3,197,106. 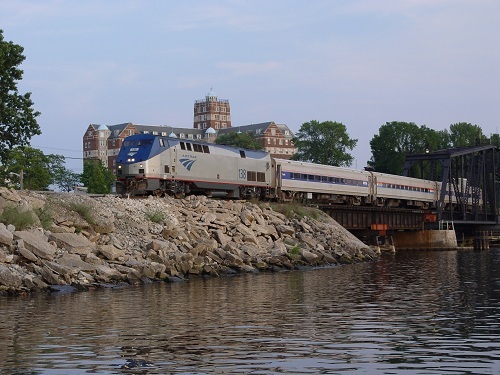 Amtrak operates the Blue Water and Pere Marquette services under a contract with the Michigan Department of Transportation (MDOT). At this time, Amtrak does not receive any direct state support for the Wolverine service. Michigan is one of 15 states that provide state-supported service. For a Station Activity Summary Report that shows individual station statistics for FY 2010 and 2011, go to the MDOT Web site for details.